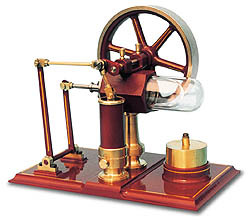 With this modelof STIRLING motor you acquire a fascinating piece of technique tradition. It was also constructed by ourselves and demonstrates the pursuit of the miniature mechanical engineering. For the development of this model a stylish, but simple construction was placed into the foreground. Due to its clear design this modern STIRLING interpretation becomes an exceptional eye-catcher and last but not least for many people already today a technical collector‘s item. flying wheel D-90 mm, heating-/displacement-glass cylinder.